There are many evil dictators in the world. They come in all shapes and sizes, do dastardly deeds and are generally very unpleasant. These despicable souls take away free milk at school, brainwash the public into thinking that Joe McElderberry is a musician and drop people into secret tanks full of piranhas when they least expect it. Like any other person, the evil dictator likes to spend time pursuing his hobbies. It is just unfortunate that his hobbies tend to include murder, genocide and stealing sweets from children. But, of course, an evil dictator’s life isn’t all fun. For the path along which an evil dictator walks can be a fraught and lonely one, beset with perils and difficulties – such as paying the gas bill, separating the plastic recycling from the paper and, of course, remembering to eliminate Roger Bayliss at number 24 before 15:00 hours GMT. Recently the Worldwide League of Evil Dictators has complained that the general public have the wrong idea completely; that they, in fact, are a persecuted and misunderstood minority themselves. 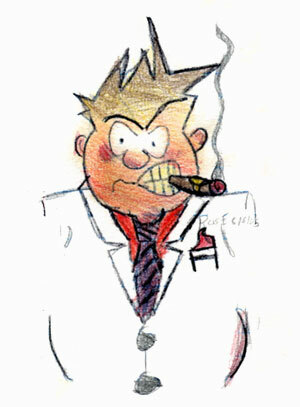 Nevil Troublegum (not his real name) runs an evil dictatorship in Guildford, Surrey (not his real home). His business (not his real business) has gone from being a small (not really small just a little bit small), home-spun (not really a house at all, in fact) affair in the late seventies (not really the seventies), to becoming a fully-fledged government-threatening conglomerate of revenge and extortion. He even has his own executive white-cat (not a real cat) complete with diamond (not a real diamond) collar and malevolent purr (more of a squeak really). Next week The Latest talks in more detail to Nevil “Evil” Troublegum and to Professor George Troddlebottom, chief lecturer on the Evil Dictator Studies BA course at the University of Avocado, Birmingham, in an attempt to find out, once and for all why the general public disapprove of evil dictators so much.